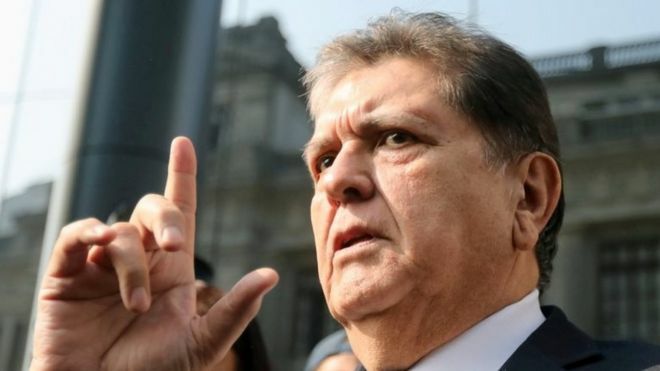 Peru's former president Alan Garcia was according to report shot himself before he was arrested by police in connection with a bribery investigation. Garcia was rushed to Jose Casimiro Ulloa Hospital in Lima at 6.45am local time (12.45pm BST) with a bullet wound to his head. "At this moment, the patient has been in an operating room at the said hospital since 7.10am," the country's health ministry confirmed. His lawyer Erasmo Reyna also confirmed Wednesday's shooting to reporters. Judicial orders seen by The Associated Press confirmed an order for Garcia's arrest had been issued. Garcia, who is 69 years old, served as president between 1985 and 1990 and again between 2006 and 2011, is alleged to have he received illegal payment from Brazilian construction giant Odebrecht. Odebrecht is at the center of Latin America's biggest corruption scandal after admitting in a 2016 plea agreement with the US Justice Department that it paid corrupt officials across Latin America nearly $800 million (£613 million) in exchange for major infrastructure contracts. Garcia has been under investigation for bribes allegedly paid during the construction of Lima's metro during his 2006-2011 government. He has denied ever receiving money from Odebrecht. The scandal has led to the jailing of numerous politicians across the region, especially in Peru.